(Nanowerk News) A multi-institutional research team has developed a new electroactive polymer material that can change shape and size when exposed to a relatively small electric field. 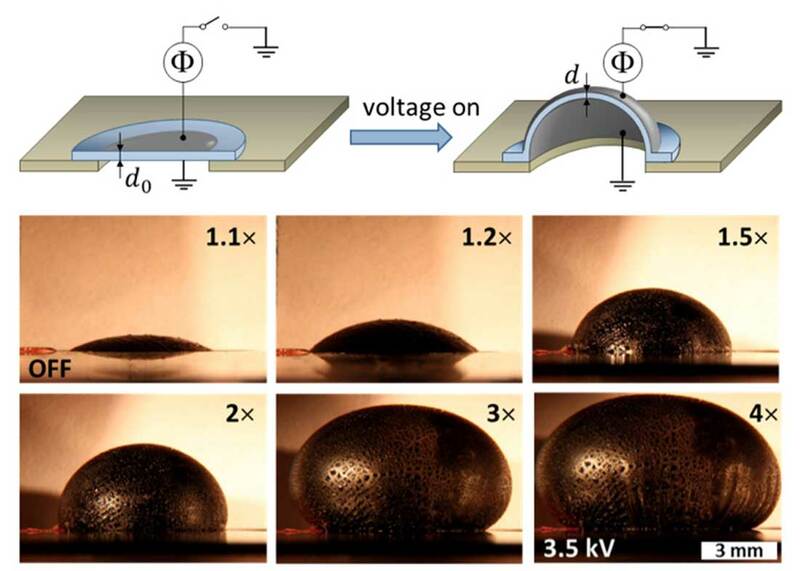 The advance overcomes two longstanding challenges regarding the use of electroactive polymers to develop new devices, opening the door to a suite of applications ranging from microrobotics to designer haptic, optic, microfluidic and wearable technologies. The work was performed by researchers at North Carolina State University, the University of North Carolina at Chapel Hill, Carnegie Mellon University and the University of Akron. The new material that has permitted this breakthrough is a “bottlebrush” silicone elastomer, which has been engineered to possess these unique properties, and it is not difficult to manufacture. “We are working specifically with bottlebrush polymers, which are prepared by grafting long polymeric side chains to a polymer backbone,” says Sergei S. Sheiko, George A. Bush, Jr. Distinguished Professor of Chemistry at UNC and corresponding author of the paper (Advanced Materials, "Bottlebrush Elastomers: A New Platform for Freestanding Electroactuation"). “The resulting molecules may be viewed as filaments that are thick, yet remain quite flexible, which allows for significant reduction of the materials’ rigidity and makes them more stretchable. Furthermore, the mechanical properties can be controlled by varying the bottlebrush architecture – for example, by preparing molecules with different degrees of polymerization of grafted chains and different grafting densities. This video shows reversible electrical actuation of a pure bottlebrush elastomer without the addition of any external pre-strain (which, trust us, is pretty interesting if you're an engineer).